Barred Pargo live in the Eastern Pacific from Baja to the Panama area and in the Sea of Cortez. They are a powerful fish reaching about 30lbs. Smaller fish live in rocks in shallow water near shore, while larger specimans can be found on rock piles farther offshore in deeper water. They are a very tough adversary as they will always head straight into the rocks when hooked just like most snappers. Barred Pargos have strong teeth made for chomping down on crustaceans. They eat those along with small fish. During the day they often hide out in caves but will come out to chase food. They are good eating but hard to clean due to tough scales and skin. They are not a very common species and in the future I plan to release the ones I catch. I would recommend a medium weight saltwater conventional setup rated 20-30lbs or so, maybe heavier if you are targeting the big ones. You could also use saltwater spinning gear. If you are fishing lures you would use a longer rod in the 7’+ length, and if you are fishing with bait you could get away with a slightly shorter rod. If you are trolling along rocky shorelines or fishing bait on the bottom you can use a short rod. The ideal setup would probably be a Shimano Trinidad reel or if you wanted to go with spinning gear a Daiwa Saltiga reel paired with a nice Calstar rod. Wire leaders would help with cutoffs but I don't recommend them since you won't get many bites. Barred Pargo can be caught casting lures or bait in very shallow water near rockpiles near shore or bottom fishing farther offshore with bait or jigs. However you fish for them, make sure you have a very tight drag to have a chance of keeping them out of the rocks. I usually fish with the drag almost completely locked down for most snapper since the most common way you lose them is when they break you off in the rocks. I would rather take my chances on them possibly breaking my line before they get in the rocks because it is a near certainty once they get in there. Barred Pargo will readily strike surface iron jigs or large Krocodile spoons cast over rocks and slowly retrieved so that they kick side to side. This is probably the most fun way to fish for them. Metal jigs fished vertically over rocks can also work well in deeper water. Live baits such as sardines work well. Barred Pargo don't have huge mouths so don't use giant baits. Chunks of oily baitfish such as bonito or skipjack can work. The Sea of Cortez has some nice ones but they are getting fished out. My biggest ones have come from Puerto Vallarta where they are farther offshore and face less fishing pressure. Barred Pargo caught near Cebaco Island, Panama on a surface iron jig. 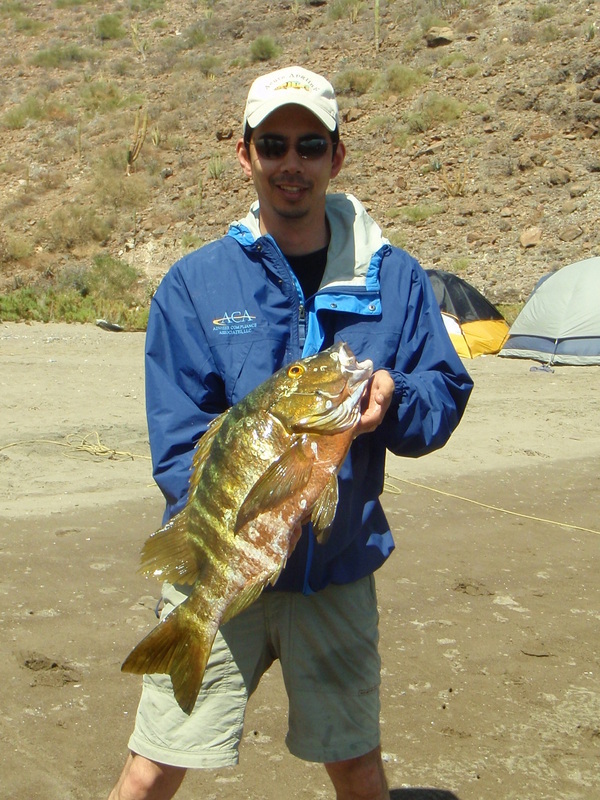 Barred Pargo caught near San Evaristo, Baja Sur, Mexico on a surface iron jig.